Modern moments, when speaking of our lives today, demand our constant attention for expeditious results in completion of tasks and duties with rarely a moment to relax. Such is the parallel between this idea and the music of ‘Tres Momentos Modernos’ where idle inactivity is the enemy of great achievement, and must therefore be used sparingly. 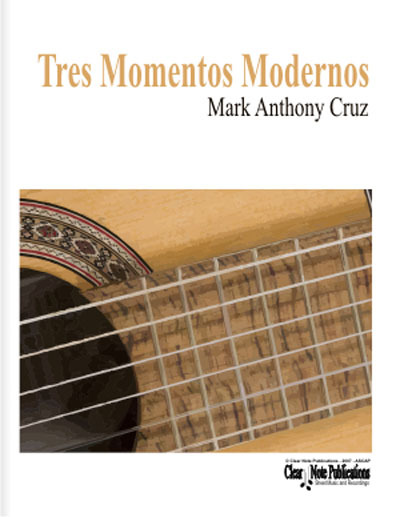 Each piece in ‘Tres Momentos Modernos’ are small musical ideas gathered together to form one large A section per movement. Essentially, each piece (or large A section) is repeated and concludes with a coda. No. 2 is the only one of the three that provides a slow B section to serve as a central pivotal moment within this collection as a whole. This slow B section also serves as the only source of relief from decisive motion.